A colourful cartoon racer that lifts some of Nintendo's big ideas, but not its attention to detail. Trailblazers, in a formula that blends F-Zero with Splatoon, becomes an excellent game and one of the best of its kind. Extremely fun in solo mode and a marvelous experience when played with friends, we recommend it as a great representative of driving games. A variable frame rate is an out and out killer for any racing game, and despite Trailblazers' clear potential it's impossible to see past that. The overall concept, of merging F-Zero and Splatoon, is a fantastic idea, but perhaps it needed a bit longer in development in order for it to be fully realised. Trailblazers is an amazing driving game that uses colors to bring something different to the driving genre. It's a pity that the multiplayer of this mix of Splatoon and F-Zero only allows 4 simultaneous players. Trailblazers is a race-and-paint game for children. With its smooth, consistent gameplay and simplistic challenges, a group of toddlers could be content for hours. Just don't be surprised when the 12 year old is reaching for Grand Theft Auto instead. Trailblazers isn't a bad game at all, it just doesn't do anything to make me ever want to go back to it. The multiplayer portion of the game does not have enough players to get into matches consistently (or ever, in my case) leaving the lacklustre single player content. There's also the local multiplayer but, just like the single-player content, you and your friends will get bored relatively quickly. To top everything off, the price of the game is far too high for what you are getting, making it difficult to convince anyone you know to pick it up. Gameplay-wise, Trailblazers kicks off on all cylinders in a wonderful first impression. However, it drags on its way to the finish line, which is why a driver might prefer some company to keep them entertained along the way. Some performance issues aside, this remains an engaging, and rather different, racing game that just about overcomes its problems to offer some good old fashioned fun. Overall, Trailblazers is a great little racer and one I aim to come back to in the near future. Trailblazers has plenty of charm and style with its gimmick of painting your way to victory, but it barely crosses the finish line thanks to its uneven AI, sloppy handling and lackluster multiplayer. Trailblazers certainly paints its own trail in the arcade racing genre, something we don't really see very often. Splitscreen support for up to four players is ambitious as well. An actual story mode with an interesting cast of characters provides a bit of extra, unexpected entertainment, as well. Online may be a ghost town, as with many smaller releases, but couch co-op/competition is where the most fun is sure to be had. A lack of arcade racing features, such as powerups, means that it leans heavily on its paint theme, which may bore some after a bit. But for a quick splitscreen showdown, Trailblazers is easy to get into and not too heavy on the wallet at around $30 USD. Trailblazers is a fantastic game that blends racing and a team-based dynamic to craft a memorable experience. 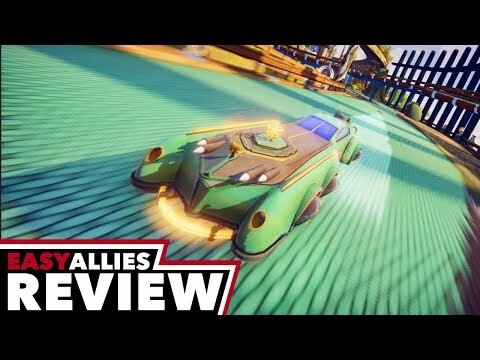 Trailblazers is has well defined visuals and plays great, with an interesting mechanic that unfortunately doesn't support the weight of a full game. Had the paint mechanic been merely one element in a grander design, things may have turned out differently. As it is, Trailblazers stands as a great proof of concept for what may hopefully evolve into a deeper title in later releases down the road. Trailblazers successfully sets itself apart from others in the same genre, especially as the Nintendo Switch marketplace is full of crazy racing games. While it is evident that the soundtrack and art style are somewhat borrowed, they have been churned into a product that is new, refreshing and unique, blazing itself a trail all of its own. Trailblazers comes recommended, but with the qualifier that you may want to wait for a few more patches to drop, first. Dynamically future racing with track painting offers unique experience, although with some flaws. Trailblazers is a very fun combination of gameplay mechanics we've seen in other games, bringing them together in a racing game that stands out from the crowd. If you're into slower racing games then this game one is not for you, but if you like to dive into fast-paced racers with interesting gameplay mechanics that add a new twist into the mix, then be sure to check out Trailblazers today!